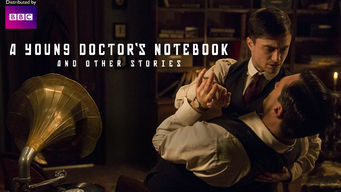 How to watch A Young Doctor's Notebook and Other Stories: Series 2 (2013) on Netflix Bangladesh! Sorry, A Young Doctor's Notebook and Other Stories: Series 2 is not available on Bangladeshi Netflix, but you can unlock it right now in Bangladesh and start watching! With a few simple steps you can change your Netflix region to a country like Argentina and start watching Argentine Netflix, which includes A Young Doctor's Notebook and Other Stories: Series 2. We'll keep checking Netflix Bangladesh for A Young Doctor's Notebook and Other Stories: Series 2, and this page will be updated with any changes. A Young Doctor's Notebook and Other Stories: Series 2 is not available in Bangladesh BUT it can be unlocked and viewed! Set during the Russian Revolution, this comic miniseries is based on a doctor's memories of his early career working in an out-of-the-way village. It's hard for most to look back and pinpoint where they went wrong in life. This doctor remembers perfectly. Season 1 of A Young Doctor's Notebook and Other Stories has 4 episodes. Because different Netflix countries have different availability for episodes, you'll need to check the episode listing below to see which are available in Bangladesh. Using his journal to prompt his memory, the doctor recalls his youth, when he was sent to the frigid tundra of rural Russia at age 25. Despite his efforts to look more commanding, the young doctor is still living in the shadow of the physician who formerly occupied the house. Excruciating pain in his abdomen drives the young doctor to consider desperate measures. As the young doctor descends into dark hallucinations, his older self tries to prevent him from ruining his life. Season 2 of A Young Doctor's Notebook and Other Stories has 4 episodes. Because different Netflix countries have different availability for episodes, you'll need to check the episode listing below to see which are available in Bangladesh. The young doctor and midwife Pelageya frantically attempt to cover up the morphine shortfall, leading to a life-threatening accident. The younger doctor leaves Pelageya when he becomes besotted with a beautiful aristocrat. The older doctor is appalled at his younger self's callousness about Pelageya's condition and his destructive behavior over Natasha's fiancé. An explosion rocks the hospital. The doctor is torn when he must choose between his morphine addiction and helping an injured Natasha. Want to learn how to get American Netflix in Bangladesh?